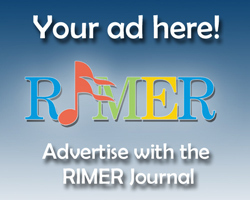 The Rhode Island Music Educators' Review (RIMER) is the official publication of the Rhode Island Music Education Association. All members of RIMEA are encouraged to submit material of interest to our profession. For publication consideration, please send all manuscripts to the Editor. News, special events, articles, and suggestions are always welcome!